Growing up around East Idaho offers a lot of outdoor activities especially in the winter. One of our favorite places that we frequent every year since I was little is up at the slopes at Kelly Canyon. I took my first ski lesson when I was in 4th grade, and I remember how proud I was to show my “report card” to my parents after a day on the bunny slope. My family, we started off to ski first when we I was little. My first pair skis I got was some Rossignol‘s. I remember like it was yesterday they were White purple pink matching poles and boots. I was blessed to open up a new Columbia coat that matched my gear. I couldn’t wait to wax my skis. My mind set I already felt like I was a pro and going big. I had the gear and the vision. After a few seasons of course I decided to rebel against my family, all of whom were skiers. I took up snowboarding. Back then instructors didn’t quite know how to properly teach snowboarding—the sport has come a long way since the 90’s. I was in middle school when I first strapped my feet into a pair of snowboard bindings. Most of my friends had been skiing or snowboarding for many years by this point. Overhearing their lunchroom chatter about how much fun they had over the weekend convinced me to talk my mom into signing me up for a lesson.The nerves in my legs and frost in my toes on that first chairlift ride with a board strapped to my feet up the mountain quickly turned to warmth and exhilaration once I was able to connect a turn or two down the mountain. I was able to see and feel the excitement my friends were talking about in school. After a few more lessons, I could join my friends on the mountain, and we shared many years of unforgettable memories riding lifts, hitting jumps, eating pizza and telling stories. 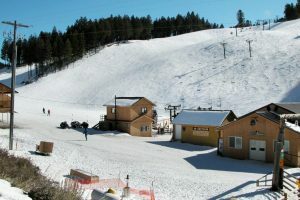 Kelly Canyon Ski Resort is a 30 minute drive northeast from Idaho Falls. Founded in 1957, the resort has been described by accomplished skiers as the perfect place to learn to ski and board. With terrain suited for all levels of skiers and snowboarders, Kelly Canyon Ski Resort is a family friendly atmosphere for winter enthusiasts of all ages.The Resort offers lift tickets, yummy food, and rental gear at affordable prices. Kelly Canyon is well known for its NIGHT SKIING with approximately two-thirds of the mountain lit for a unique winter experience. Long-running ski resort boasts 640 acres of terrain & groomed runs, plus a half pipe for boarders. I believe there are so many reasons for families to hit the slopes! There’s the thrill and exhilaration for all ages, it offers great skill development, a variety of health and fitness benefits, and it’s a sport that families make memories from throughout their lives. Snowboarding/Skiing opens up many opportunities for travel, or fun close to home as well. At Kelly Canyon there are generations of skiers and riders unite, sharing spectacular memories and amazing adventures.Is a family snowboard/ski vacation on your bucket list? Snowboarding/skiing is a wonderful sport for the entire family. If you’re new to snowboarding or this is the first time going to Kelly Canyon with the entire family, take these recommendations from to ensure your family snowboard vacation is a huge success with wonderful memories for every member of the family.The first step is to secure your dates and purchase your lift tickets. While family snowboard trips are not inexpensive, there are several hidden tips to keep a reign on the budget. Snowboarding/Skiing up at Kelly Canyon are not limited to snowboarding, From tubing to skiing there’s something for every member of the family. For beginning snowboarders/skiers, there’s no better investment to ensure a fun filled week of snowboarding/skiing than to enroll in at least a half day snowboard/skiing lessons. Kelly Canyons experienced instructors will teach the basics for control and navigating the slopes. Even the most experienced snowboarders/skiers can benefit from lessons as well. Consider purchasing snowboard/skiing passes for half days during your stay. Snowboarding/skiing is a rigorous sport and few can manage eight to ten hour days on the slopes. Have a grand time making life long memories with your family snowboarding/skiing. Have fun! Laugh at yourself as you are learning, and be proud of you and your family’s improvements. Soon you and your kids will be riding the lift together, taking photos, and sharing in some of your favorite family memories. Not too far from the slopes you can venture Down and relax in the hot pools at Heise. There also is the famous Heise Pizza Parlor to hit after the slopes if you don’t eat at the lodge. Families are built on a foundation of love, and love, as you probably know, doesn’t simply happen. Love takes work – especially when the details of the day-to-day grind seem to crowd out everything else and leave you short on time and sapped of energy. “Making memories” is one way to create a lasting sense of common identity and shared family heritage among the members of your household. If you’re a parent, there are many simple things you can do to build memories and enhance special occasions with your child. When schedules are jammed with activities, it’s easy to lose sight of life’s little pleasures. But if you take the time to notice those pleasures, dwell on them and bring them into focus, you’ll find that you’ve already taken a huge step in the direction of cementing meaningful, lifelong relationships with your children. Start making new memories and start with Kelly Canyon Resort!